King's Palace with the room for the rest of us. You may have noticed that in my travel stories I rarely mention a specific hotel - unless, of course, it is so unique that it can be considered a destination onto itself. In this case, this particular hotel is so classy and elegant, so full of history and legends - and it's not the Ritz - that it might even be worth traveling over the pond to experience it personally. Allow me to take you there for a short tour and you might agree with me after all. First, let's set the place and time. Place - the heart of Madrid at Plaza Neptuno, close to the iconic Plaza de Cibeles and just steps away from the legendary Prado Museum. A truly privileged location by any guide book's standards. Time - between October 1912 and today, choose any day from the more than 100 years of its glorious history. Come with me through the entrance, unusually positioned at the corner of the building, to the lobby, which is gracefully understated yet still manifests old-world elegance with its finest quality furnishings and delightful fresh-flower arrangements. As we walk through, don't look surprised if we see someone famous passing by. This hotel has hosted so many celebrities, stars, and luminaries, it feels like you can still see them - as a spirit or the real person, depending on your luck and imagination. Over there is a mustachioed gentleman that looks so much like Mr. Albert Einstein. Indeed, the scientist stayed here while giving lectures at the University of Madrid. That group of excited young gentlemen with flowers? It is Serge Diaghilev and his Ballets Russes dancers having just returned after their performance at the Teatro Real. And the lady of exotic beauty that just passed us… You probably did not recognize her face, but you may have heard her stage name: Mata Hari. Take a quick peek through the door leading into the bar. It is the best place for a cocktail in Madrid, but that is not the reason I show it to you. Those three young men seated at a table discussing, perhaps a bit too vigorously for such a high-status place, principles of Surrealism? They are Salvador Dali, Federico Garcia Lorca and Luis Bunuel. Legend has it that one day the hotel guests were treated to the sound of a voice singing "Nessum Dorma" as if it was coming from Heaven itself. Close, but not quite - it was from the Royal Suite on the fifth floor, which has been a favorite place to stay for Luciano Pavarotti. I know, some of us don't care as much about history, lavish interiors, or famous names, and that can certainly be understandable. However, there is one thing that we, travelers, all care about: how we are treated or what goes by the official name of 'the customer service.' When staying in this hotel, it's not just like feeling at home, it's like being treated by gracious host offering incomparable hospitality. As far as hotel management is concerned - I'll quote - "the level of service afforded to the hotel guests should be restricted only by limitations of the law." Just a quick example: Michael Jackson requested that a wooden dance floor will be installed in his suite. The floor was ready for him when he arrived. Another guest booked a room conjoining to his suite and asked for the furniture to be removed in order to make room for an extensive - Royal, in fact - wardrobe. It was done with no questions asked. One aristocratic polo player got sick and had to stay in bed for days. He requested that two mares that he had come to Madrid to buy be brought to his room for inspection. The horses were walked through the building and up to his room without incident. Yours truly had a chance to interact with a concierge and other front desk personnel. While my needs were way less extravagant, I was still impressed by the pleasure - no less - of those interactions. I observed that it takes a scant few seconds for a guest to stop in the lobby, with even the dimmest puzzlement across their features, before someone from uniformed hotel staff will immediately materialize right next to him or her and ask how they can help. So, there is only one thing left to do - to give out the name - and I'm happy to do it. 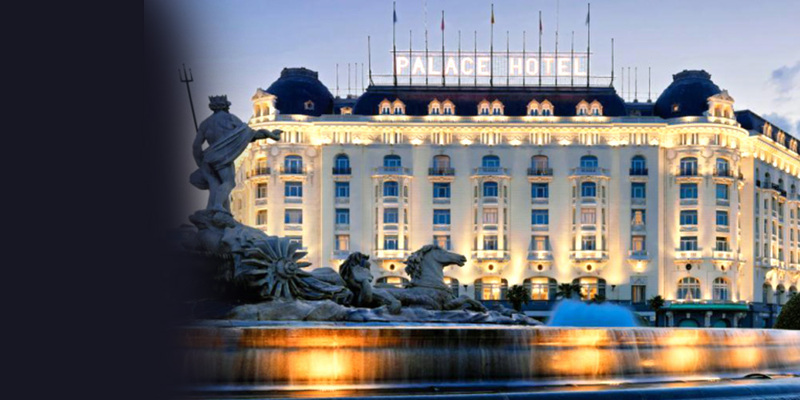 It's Westin Palace Madrid, and while you'll stay there, I'll be thinking of you with envy.